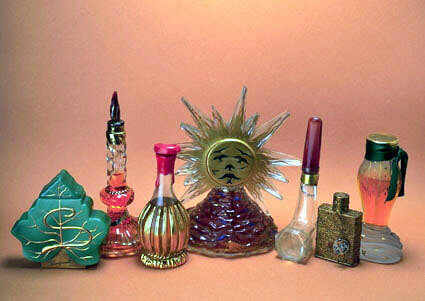 Perfumes and fragrance ads by Elsa Schiaparelli. 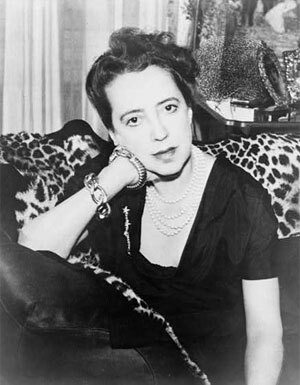 Elsa Schiaparelli, (10 Sept. 1890 - 13 Nov. 1973) was an Italian fashion designer, at the top of the Parisian haute couture between the World Wars. Her designs were inspired by Dada and Surrealism art, and she worked with artist, such as Salvador Dali and Jean Cocteau, in the creation of some of her more memorable fashions. Art was so much a part of her design process that her rival, Gabrielle "Coco" Chanel, referred to her as "that Italian artist who makes clothes." 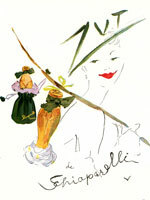 Influential artists created the advertising campaigns for "Schiap's" fragrances. Salvador Dali's print was used in a Shocking campaign. Raymond Peynet leant his "Lovers" in a Valentine's ad for Succes Fou. 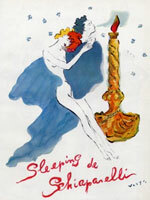 Fashion illustator, Marcel Vertes, who Elsa Schiaparelli also worked with on the costume design (Zsa Zsa Gabor) and set design of Moulin Rouge (1952), created numerous ads for Shocking, Zut, and Snuff fragrances, among others. Schiaparelli made famous the use of fashionable zippers in day and evening wear, using large buttons of butterflys and bees, and her color Shocking Pink (known in America as Hot Pink). The bright magenta color was used in the packaging of her Shocking perfume, designed by Surrealist painter, Leonor Fini. The fragrance bottle resembles a woman's torso, which Elsa took inspiration from using Mae West's tailor dummy (Mae West was a long time customer of Schiaparelli, as was Daisy Fellowes, whose Cartier pink diamond inspired the color of shocking pink). 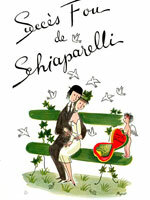 Elsa Schiaparelli's "Schiap Shop" was established at 27 place Verdome, Paris. Elsa started making fashionable knitwear which led into a wide range of clothes and accessories designed in her avant-garde style. 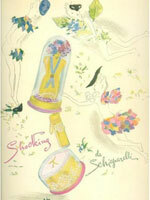 Schiaparelli is not associated with Pikenz. Stay up to date with the latest fragrance ads with our newsletter. © 2018 Daisy Development™ All Rights Reserved.